The company of S T Dupont was founded in 1872 by Simon Tissot-Dupont, as a leather manufacturing company making wallets and attache cases. By the end of the 19th century, there was a demand from the rich and famous embarking on the 'grand tour' for trunks and travel cases and S T Dupont were equipped to supply this market, making luxury fitted trunks and travel cases from the finest most exquisite materials and with meticulous attention to detail. S T Dupont were now known as suppliers of luxury goods to royalty, nobility and celebrities. This business continued to develop and in the 1920's Simon's sons André and Lucien were designing and making bespoke products for the royalty of Europe, as well as Maharajas and even Al Capone. The last such travel case was made in 1947, as a wedding gift for Princess Elizabeth, the future Queen Elizabeth II. The first S T Dupont lighters were made in 1941: a response to wartime austerity and lack of materials and customers. This was followed by the first gas lighter in 1952, which was a huge success and became the 'must have' lighter among the initiated. The 'Riviera' handbag followed in 1953, which marked another innovation for Dupont. 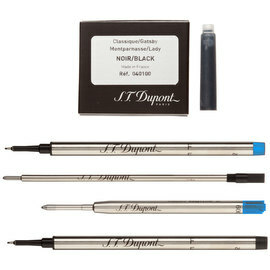 It was in 1973 that S T Dupont moved into the luxury writing instrument market with the introduction of the Classique. 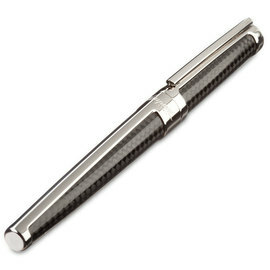 Using the artisan skills of the jeweller, S T Dupont had created a refined ballpoint pen from solid silver. In 1996, the Olympio range was added and following the success of these, the writing instrument collection has expanded and evolved to what it is today, to include the Défi and Liberté ranges, which together with the Classique can be found in stock and available to buy here from the Pen Company website. Al other S T Dupont fine writing instruments can be rapidly supplied to order, please enquire. The first pen ever produced by S.T. Dupont in 1972, the Classique is still a popular choice. 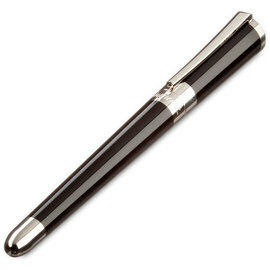 The Classique is available in gold, silver and rose gold finishes and comes complete with a 0.7mm mechanical pencil mechanism, which can be used in place of the ball pen refill. With its sleek streamline design, inspired by the jet fighter, the Défi combines a very modern contemporary look and feel with the traditions of artisan skill, quality and attention to detail for which S.T. Dupont are world-renowned. In a break away from the standard pen shape, the curving, tapered form of the S.T. Dupont Liberté cries out to be picked up and handled. The faceting of the end cap and the clip are designed to catch the light, and give added depth to this fine design. 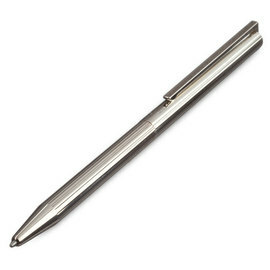 The slim form of the Liberté make it an ideal choice for anyone looking for a slightly smaller pen. The Liberté fountain pen comes with a 14K hand finished gold nib. S T Dupont refills and inks for rollerball, ballpoint and fountain pens, carefully made to ensure that your pen continues to perform as well as the day you purchased it.